I wake up about five, but hey, it’s Saturday morning and there is no rush. I turn on the TV to allegedly watch the news. Instead I always fall back asleep. Invariably I will wake back up around 7:30 when Naturally Danny Seo is on. I stay in bed and watch his show. I can never find his recipes from the show. Hardly ever. This has happened more than once. 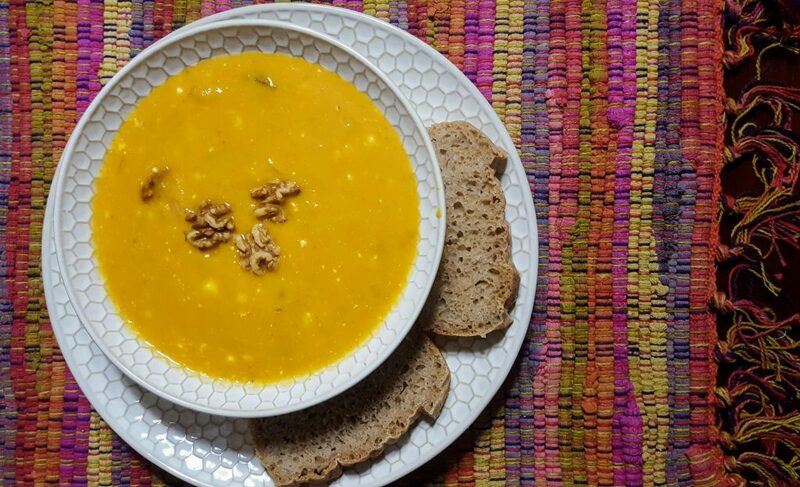 The most recent occurrence involved Danny making what I thought was a delicious sounding butternut squash soup with chorizo and walnuts. I must have still been in a sleep haze because once I fully awoke and googled the recipe (which again was problematic), I found that he had instead made butternut squash vegan nachos. While I’m not a vegan and pouring butternut squash puree over tortilla chips seemed extremely odd and unappetizing to me, the flavors of the concoction and my hazy recollection got my mind to whirring. A creamy, spicy and warming soup. In a large sauce pan, heat oil. Add onion and garlic. Sprinkle with cumin and saute until just soft. Do not brown. Add butternut puree, broth, and chipotle pepper. Stir to combine and simmer for 20 minutes. Stir in cream cheese and chopped chorizo. Heat until cheese is melted and combined. Ladle in serving bowls and top with toasted walnuts. This turned out delicious. The chipotle pepper gives it just the right amount of smokiness that the chorizo could be omitted. I really liked the crunch of the walnuts, too. Unfortunately, my cream cheese decided not to melt smoothly so I had little blobs of white. It didn’t deter the taste though. Seriously, this is good stuff. I am linking up with Deb at Kahakai Kitchen and her Souper Sundays. Wait, there’s more. I finally found the written recipe for vegan nachos on his Instagram account. Again, please don’t let my awful photos and finished product deter you from this recipe. It’s delicious! The photos look fine, Deb. I love the combo of flavours…chorizo and walnut..totally irresistible. Dreaming up a recipe? Why not? That sounds delicious! My experience: if you want the squash pureed, you can also cut it in half, take out seeds & microwave it, which is faster and easier to peel. True. I like the roasted quality though. It looks and sounds delicious. Cream cheese can be a pain to melt evenly but sometimes the blobs of it are my favorite bites. 😉 Thanks for sharing for with Souper Sundays this week.